Let's face it, forgiving those who offend us is not an easy thing to do. When we feel that we have been used, abused and unjustly treated, the human inclination is to desire revenge. When someone hurts us or someone we love, we naturally want to hurt that person back. It's true for me, for you, for everyone. Furthermore, Jesus added to this subject by saying these startling words, "But if you do not forgive others, then your Father will not forgive the wrongs you have done" (Matt. 6:15 GNB). Whoa! Talk about a heavy statement. If you don't forgive, you cut yourself off from God's forgiveness. If forgiveness is this critical, and it is, then how can you and I forgive when someone intentionally (or unintentionally) does something that hurts us deeply? Let me offer some encouragements to help you forgive that person (or persons) who did you wrong and caused you pain. 1. Focus on your own forgiveness. Matthew 18:23-35 is a great parable that speaks of the need to forgive from the heart. In that parable, Jesus tells of a servant who owed his master 10,000 talents, an incredible sum of money that could never be repaid. We are that servant. We owe a sin debt to God that we could never repay, but Jesus paid it for us when He died on the cross. As you and I focus on the awe of our own undeserved forgiveness, it helps us to forgive others who have really done very little to hurt us, comparatively speaking. 2. Exercise faith. If you wait until you feel forgiving toward that one who lied about you, betrayed you, abused you, or stabbed you in the back, you may never forgive. Obeying God's clear command to forgive is not dependent on feelings. It is dependent on faith. By faith, forgive that one who hurt you, release that one from the natural inclination for revenge and retribution. Let go of the offense and the "pound of flesh" due you. Give that offender over to the Lord, and let Him deal with that person as He sees fit. Vengeance is His, and He will repay. 3. Be good to yourself. Newsflash: Holding a grudge against someone who hurt you doesn't hurt that person, it only hurts you. A bitter, unforgiving spirit does not punish the person who offended you, it punishes you and those whom you love. It's like drinking poison, hoping the other person will die. Listen, be good to yourself. Put down the bottle of poison and release the offender from the jail of your heart. By not forgiving others, you shut off the flow of God's love and grace in your life ... but forgiveness brings it back. 4. Be a blessing to others. Paul exhorted Philemon to forgive his thieving, runaway slave, Onesimus. Paul said if Philemon would forgive, it would refresh Paul's own heart in Christ (in addition to Philemon's). Forgiveness is a God thing that always brings with it the sweet aroma of the knowledge of Jesus, the ultimate forgiver. As Mark Twain so aptly said, "Forgiveness is the fragrance the violet sheds on the heel that has crushed it." Has someone crushed you? Do the divine thing and forgive them. If you do, the sweet fragrance of forgiveness will bless God, bless you, and bless others. P.S. We'd love to pray with you. Just leave your prayer request on our PrayerWorks link. You can even receive an alert e-mail when someone has prayed specifically for your request. God wants you to understand anger and live in peace and harmony with yourself and others. 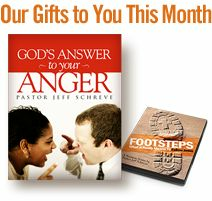 This powerful booklet will help you as you discover the root causes of your anger issues and how to effectively deal with them God’s way.